We not only offer a great variety of gourmet finest coffees, but also many excellent menus. 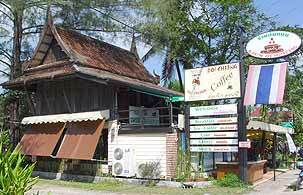 Tonbab Coffee Garden ( Arabica Thai Product "DOI CHAANG COFFEE" ) offers several cakes, cookies and other goodies to enjoy with your coffee. Enjoy the casual and relax atmosphere at Tonbab Coffee Garden . There are both of in - house corner and out-side corner, so you can get comfortable while you enjoy with your friends or family or lover. And the important thing that you should know is we have freshly roasted coffee beans products for sale too (All from Doi Chaang valley) . At Tonbab Coffee Garden it is certainty that you can take 100% Highland Arabica beans with clean, dry and airtight container at the reasonable price. Open daily 9.00 am - 7.00 pm with warm welcome and smile.